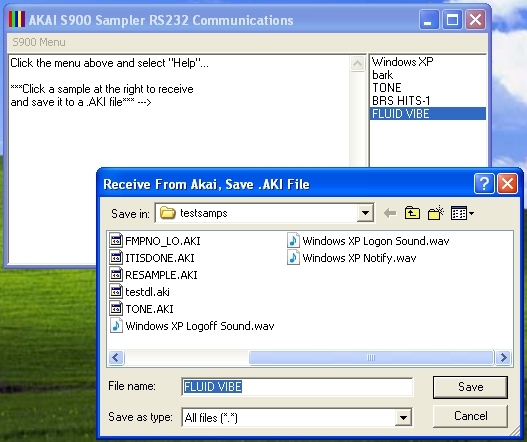 Freeware for most Windows versions that allows you to send WAV files from your computer to an Akai S900/S950 MIDI digital sampler (no other models are supported). Can send WAV files, either mono or stereo, left or right channel, from 8-64 bits. S950rs.exe is RS-232 only and does not support MIDI at this time! Sample-transfer speeds up to 57600 baud (using a USB cable with a Prolific chipset, running Windows XP in Oracle VirtualBox on Apple Mac Sierra 10.12.6). You will need a USB to DB-9 male cable: DTECH 10 Feet USB 2.0 to RS232 DB9 Serial Port Adapter Cable with FTDI Chipset Supports Windows 10 8 7 and Mac Linux. and a DB-9 female to DB-25 male adaptor (you need one without hex nuts or they get in the way): DB9 Female to DB25 Male, Adapter, (Serial Port) Molded. YouTube setup video by Scott Stanley: Transfer WAV files on a computer to an Akai S950. (11/27/17) You can now select or drag/drop multiple files. A failed packet transmit now retries two more times. (1/21/17) Timing fixed for sending multiple programs to machine from .PRG file (Many thanks to Oliver Tann for testing). (9/29/16) Updated to fix uninitialized sample parameters and header array problem. (9/10/2016) Fixed problems with reading some WAV files (thanks to Oliver for sending me sample files!). Also added drag drop to send a file and a combo-box to allow baud-rate selection. (6/25/2008) Added more info in Help. (4/19/2008) Original post required a special dll and would not run... fixed. Added support for sending either channel of a stereo sample. Added ability to send WAV of 8-64 bits.